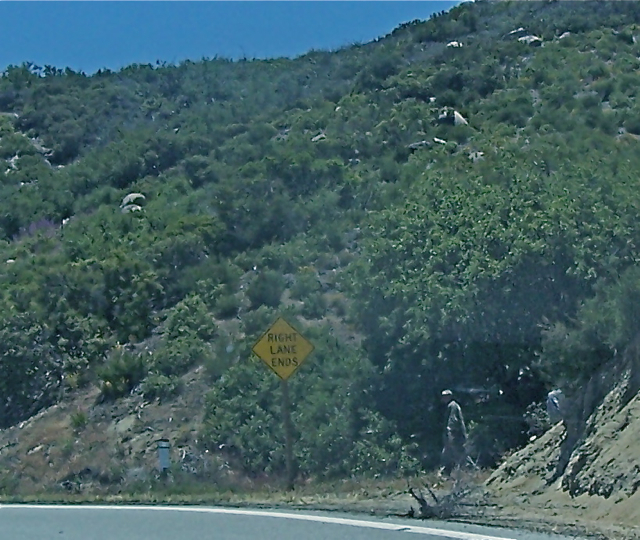 On Monday, June 13, at 12:40 p.m., two men, one in full camelflage gear, were seen attempting to cross a busy section of Hwy. 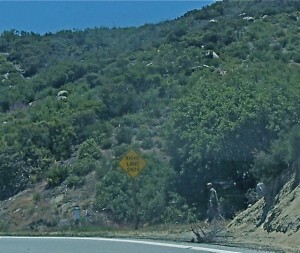 74, about a mile from Mountain Center near Idyllwild. Parked to the left in a pullout was their gray work truck full of trees. The ones on top looked like manzanitas. What were these two men in military gear doing in our national forest? Were they stealing trees? They crossed the road and went up a rough embankment, but didn’t appear to have any shovels or trimming equipment with them. 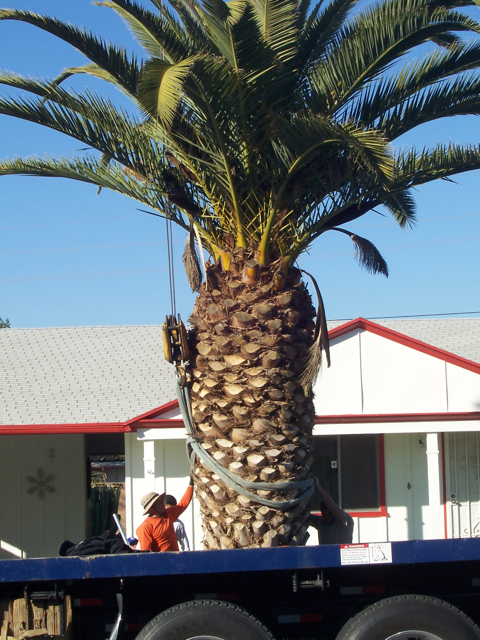 Locals know that legitimate tree trimmers come in caravans and have lots of signs and equipment with them. I doubled back around, and took a picture of the truck from the back and side. I couldn’t see where the men went, so I took a picture of the area where they entered. But, as soon as I snapped my picture, I saw one of them close up. He was in full green camelflage jacket and pants, and had a cap with a flap on the back (to shield the sun). The other guy was younger, in a grey long sleeved polo shirt and jeans. Both men were wearing light colored canvas gloves. But nothing was in their hands. When I got to Mountain Center, I called the Riverside County Sheriff’s non-emergency line. Kerie, the dispatch operator, took my information and said she’d send out a sheriff’s deputy to investigate. I gave her the nearest cross street (McGaugh Road near Mountain Center) and the mile marker, 74:58:00. She asked about the color and description of the truck. I was able to enlarge my photos to give her more detail. Alas, there was no license plate. She also asked about the nationality of the two men (Mexican), their height and weight and what they were wearing. When I had taken the picture, I was so close that I could see that one had a moustache. 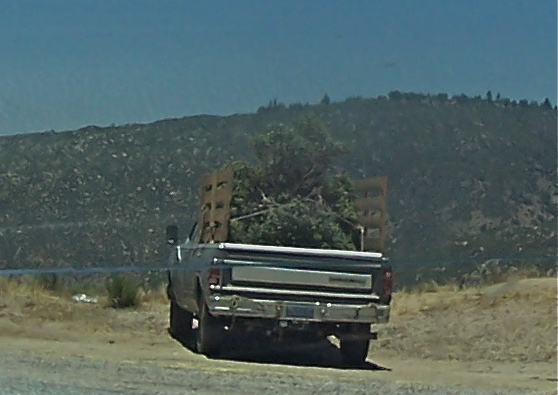 Kerie said that she thought it was illegal to take trees from the national forest. “Even if you live on national forest property, I don’t think you can pull out any trees from your yard,” she said. About 15 minutes later, she called back to verify the location. 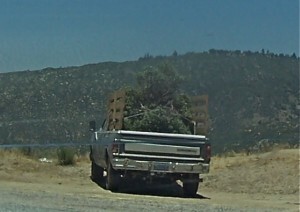 It’s tough times for everyone, and manzanitas and other full-sized trees probably fetch a good price. 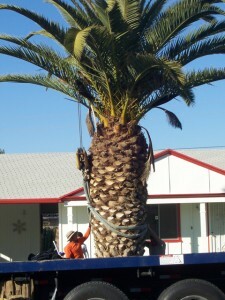 My mother’s neighbor in Sun City sold two full-sized Queen Palms for $2,000 each. It had taken them 10 years to grow, but they needed the money and someone was willing to pay. Were these two men digging up and selling our manzanitas? The ones that were protected for all of us to enjoy? If they’re gutsy enough to take them in broad daylight, how many more have they taken? Although it’s not illegal to purchase live manzanitas, they’re difficult to find. Internet searches came up with only a few native plant nurseries in San Marcos, Las Pelitas, San Fernando Valley and San Juan Capistrano. However, dead manzanita branches are used mostly as decorative centerpieces, and cost plenty online. Its hardness, rich color and unique shapes make manzanitas ideal for designers and store owners. Their branches are used for wedding centerpiece arrangements, floral arrangements, jewelry holders and even as bird perches by pet store owners. Perhaps the sheriff’s deputy arrived too late, and the manzanita perpetrators were long gone. But we, as locals from Mountain Center and Idyllwild, can still protect our national forest from tree poachers. If you see anyone like these two men acting suspicious, report them to the Riverside County Sheriff’s Department immediately. Write down the truck’s description and if you know the mile marker or nearest cross street, to help the sheriff find their location. The non-emergency phone number for the Idyllwild area is (800) 950-2444. Posted in idyllwild, Nature | Comments Off on Poaching Manzanitas Near Idyllwild?